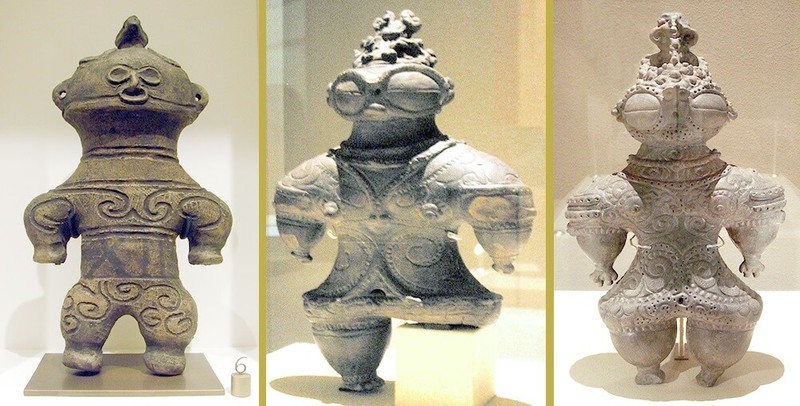 Literally thousands of clay figurines called dogu have been found in Japan that date back to the country’s Neolithic Jomon period, from 2,300 to 10,000 years old. These clay figurines depict human-animal hybrids wearing what looks like helmets with goggles on them. Some have odd elongated heads and others have almond-shaped eyes, but on all of the dogu…some 15,000 of them…the eyes are very large in proportion to the figure’s body. What exactly the dogu were used for remains a mystery. It could be that ancient cultures fashioned clay dogu to ward off evil spirits or as an item used in fertility rituals. Some schools of thought claim they were crafted to showcase real humanoid figures that came in contact with the ancient people while others claim they are god figures for shaman ceremonies.